There's no pre-cooking required in this quick and easy pressure cooker version, so it's best to use lean or extra-lean ground beef. You can partially cook the ground beef and drain it if you like—just let the mixture cool slightly before you combine it with the egg and the remaining ingredients. The cooking and natural release times total about 13 minutes, and you will need to plan on an additional 10 to 12 minutes for pressure buildup. Slice the tops off the bell peppers. Remove the seeds and carefully scrape out the white veins. Chop some of the tops for the filling. In a large bowl, combine the ground beef with the cooked rice, chopped pepper tops, onion, minced garlic, diced tomato, Parmesan cheese, tomato paste, 1/3 cup of the tomato sauce, the beaten egg, breadcrumbs, salt, basil, oregano, Worcestershire sauce, and 2 tablespoons of chopped parsley. Mix the ingredients until well blended. Stuff the pepper shells with the mixture. Add 2/3 cup of water to the Instant Pot and place a trivet (with handles) or baking sling in the pot. Arrange the stuffed peppers on the trivet and pour the remaining tomato sauce over them. Lock the lid in place and turn the steam release valve to the sealing position. Select the pressure cook or manual function (high pressure) and set the time to 8 minutes. When the time is up, wait for 5 minutes and then turn the steam release valve to the venting position to release any remaining pressure. 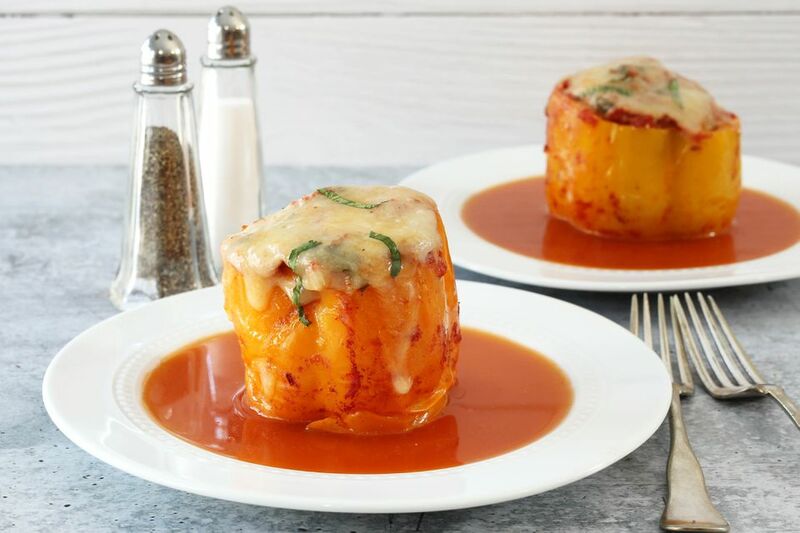 Top each of the peppers with a generous amount of mozzarella cheese and place the lid back on for a minute or two, or just long enough to melt the cheese. Remove the peppers and trivet and set aside. Choose the sauté function and simmer the liquids for about 5 minutes to reduce slightly. Taste and adjust the seasonings. Serve the peppers with the reduced sauce and garnish with thinly sliced basil leaves or chopped fresh parsley. For a lighter alternative, make the stuffed peppers with ground turkey. Lower the carb count by using cauliflower "rice" in the meat mixture and omit the breadcrumbs.